A male Western Tanager visited a private feeder in Long Valley on April 23-24 and was viewed only by the homeowner. It has not been seen since. The bird’s identity was not confirmed until photos were viewed after its departure. Western Tanager (WETA) is a New Jersey review species. This will represent the fourth record of WETA in Morris County if accepted by the New Jersey Bird Record Committee. The time of year this individual appeared is also of interest. Most WETA sightings in New Jersey are in the fall and winter. The few spring reports occur earlier than the April 23-24 dates of the Long Valley WETA. One exception is a 1977 WETA which had an extended stay during June in, of all places, Morris County. George Nixon of Rockaway sent a photo of a Summer Tanager that visited his feeder in the afternoon today. This is only the fourth known record for Morris County. See the photo below. This is a review sub-species for New Jersey. The list of review species is here. 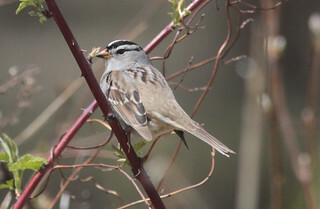 One distinct difference between Z. l. leucophrys, the nominate species we see in New Jersey, and Z. l. gambelii, is the color of the loral region (the area between the base of the bill and the eye) – it is black in the former and pale gray in the latter. Also, the bill color for Z. l. leucophrys is in the pink spectrum. Z. l. gambelii has a orange-yellow or orange-pink bill. A very interesting find. Yours truly led a New Jersey Audubon All Things Bird walk at Troy Meadows today. Migration is slow, but nine people enjoyed a beautiful day and a lot of walking. Some of the birds observed were Northern Waterthrush, Palm and Yellow-rumped Warblers, Warbling Vireo, Blue-gray Gnatcatchers, Hermit Thrushes, Brown Thrasher, Bald Eagle on the nest, Savannah Sparrows, Purple Finches, displaying Wild Turkeys, etc. Blue-headed Vireo, Yellow-rumped Warbler, Black-and-white Warbler, Blackburnian Warbler, Cedar Waxwing. The Black-crowned Night-Heron of Jefferson Road Pond was seen early this morning – first, on the south side of the road. Then it flew to the northwest side of the pond and then to the southeast side of the pond. In other words, if it is not seen, it is probably there, somewhere. Chris Thomas managed a photograph early in the afternoon. See below. 3 Virginia Rails were grunting near the back boardwalk today at Lord Stirling Park (Jeff Ellerbusch). A sound recording of one is here. Also present were Warbling Vireo, Common Raven, Marsh Wren, Hermit Thrush, Wood Thrush, Ovenbird, Common Yellowthroat, Yellow, Palm and Yellow-rumped Warblers, Rusty Blackbird, Orchard Oriole, Purple Finch and Pine Siskins. Boonton Reservoir continues to have a Red-necked Grebe and 6 Horned Grebes. Where none were seen yesterday, 2 Common Loons were at the north end this afternoon. Virginia Rail, Ovenbird, Northern Waterthrush, Black-and-white, Yellow, Palm, Pine and yellow-rumped Warblers and Purple Finch were at the Great Swamp NWR (Simon Lane).